So I am home with the girls all by myself until Sunday night. Clint is out of town. I haven't been alone with them overnight before. Well not that I can remember in the past almost 6 months. It is weird. I miss Clint. Even though sometimes when we get home we sit in separate rooms watching different movies or T.V. shows. But tonight I miss him. I had to go to "Meet the Teacher" night at Mollie's school. It is her same teacher from last year but I still had to go get the outrageous school supply list. So I guess tomorrow I will be at Wal-Mart in all the madness getting school supplies. I am working from home until Wednesday. It will be like an extended vacation. The twinies are doing great. Getting bigger and more interactive every day. We have a nice little routine down. They go to bed at 8 p.m. and sleep until 5:30 a.m. I guess I can't ask for more at this point. They smile and giggle and have learned what their hands are and that they can hold a bottle. Peyton loves to sleep with a blanket next to her cheeks. It is so cute. Katelyn is still a piglet and loves to eat. She is also going to be the baby that puts EVERYTHING in her mouth. The twinies are for sure more fun than when we first came home. Mollie is a ham. She is so ready for school to start. She can't wait to see her friends. She has discovered Lunchables. I think they are a waste of money but she loves them and has asked to take them everyday for lunch. Let's hope there is a big sale on them some where. I would like to wish Manda, Jason and Ada a good vacation. I know they will have so much fun. I also want to congratulate Stacey, John, Jack & Caroline (the last two are twins but no they are not identical!!!) on the birth of their daughter/baby sister, Lauren Jenna. I know that some of you may not know them but they are all friends of mine that are in the twins club. Manda, hope your pregnancy is going great and there are no troubles. Jennifer (that's my cousin) I can't wait for you to have your baby girl...I need to empty the twins closet. I can't wait for the twins club yard sale next weekend. The twins need fall/winter clothes terribly. Written by: Danielle at 9:34 PM 0 you know! Well after one day of keeping the twins, my mom said she couldn't do it. So at home I sit. Thank goodness my job is being great. I am allowed to work from home until next Wednesday so that I have time to find a new sitter. So if you know of a sitter that wants 5 month old twins and part time 4 and 1/2 year old, please get in touch with me.....I am at a loss right now and we CAN NOT afford a daycare center. I really like working from home, it is great. I just have to find a solution. Mollie starts Pre-School next Tuesday. Next year will be the tough year, I will have to put her on the bus for Kindergarten. 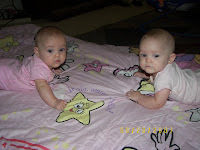 The twins are trying to roll over and the giggle now. It is so cute. Well I am supposed to be working so I hope that someone still reads this! Written by: Danielle at 3:36 PM 1 you know! Yeah that is right....I am updating my blog at 3:49 a.m. Why, you may ask...Well I woke up at 2 something and just couldn't sleep then about 3 something Peyton woke up fussy. I brought her dowstairs for a bottle and by the time she finished, she was asleep and I was wide awake. I have discovered that there is NOTHING on T.V. this late or should I say early in the morning! This reminds me of my days in the hospital wondering if and when the twins would make their debut. The sleepless nights due to machines going off or a nurse visit. Hard to believe that the whole hospital experience started 5 months ago today. I went in for a routine kidney infection and ended up staying. I was in their for my stinkin' birthday! Is it the time that makes me feel like I am rambling? I know it can't be from nothing to talk about. My work is going good. I have been approached for a potential new job. No talk about it yet but it would be something I would LOVE to do! Clint's new job hunt is going well. He has two potential leads. One is for Altell in Little Rock (that is their headquarters) but who the heck uses Altell? The other is for the Arkansas state government. Please pray for us. This would be one of the best things for our family right now. Well I think I am off to pick out clothes for today and try to get 1 and 1/2 hours of sleep before it is time to wake back up! Have a great day! Written by: Danielle at 3:48 AM 2 you know! I did it....Finally.....The twins now sleep in their own cribs. I kept talking about it and talking about it but never did separate them. Finally last night, they were put to bed in their own cribs. They only woke up once and when I went in to their room, I just gave them each their binkie and they went right back to sleep. We rearranged the girl's room (well Clint did and I just gave my opinions! )and the room looks so much bigger now. It is amazing! I hope that they will get used to the new sleeping arrangements soon. I am trying to locate a baby sitter. I need a full time sitter in 2 weeks. My cousin has been keeping the girls and I love her keeping them but she is a teacher and has to go back to work and Clint does not want my mom to keep the girls. They had a falling out a while back and the tension is still there. I don't know what else to do. We can't afford a day care center. I want a good cheap babysitter. Is their such a thing? I left the girls (all three of them) downstairs last week or sometime in the past few weeks while I ran to change clothes and use the bathroom. 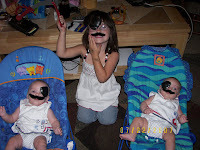 When I came downstairs, my three girls had been transformed into PIRATES!!! Written by: Danielle at 2:10 PM 0 you know! So back to work I came and man does it feel good. You know to get up every morning and actually take a shower with the purpose of going somewhere. I could do without having to dress up but there are days that it feels nice. I think I am adjusting well! I feel better and less depressed these days. I like to have a few moments of quiet after I drop Clint off at work and while I am on my way to my office. It is wonderful. But I do have regrets. I want to still be able to see the kids. So my desk is scattered with pictures of the girls. My desktop on my computer is a picture of the three girls. I have a sign up on my desk that says "YES they are twins, YES they are both girls, NO they are not identical". Keeps me from having to repeat myself time after time. So I haven't been good about updating and I vow to keep myself on track and stay updated. I realized that several other moms have started blogs recently and I must say I enjoy reading them. I also enjoy Manda's blog. She is an eloquent writer and her blog entries leave me always wanting to read more. I feel like when I returned to work, I lost touch with the SAHMs that I had met and enjoyed (and still enjoy) hanging out with. But just know ladies (if you even still read this) I can call in sick any day to hang out and grab lunch! All the girls are doing good. The twins hit the 4 month mark yesterday. Wow can't believe that 4 months has past. We rearranged the girls room last night while Mollie was gone and man it looks so much better. I can't wait for her to see it. Mollie will be going back to school in less than a month. She is so eager and ready. She loves school. Will she keep that mentality until she graduates and heads off to college? I hope so. 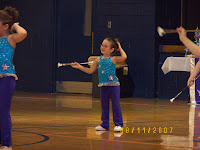 I always liked school so hopefully she gets that gene from me! I must put this in my blog. I must say goodbye to an Angel that I never had the chance to meet. Hunter Franklin Ojibway was born and passed away yesterday, August the 6th, 2007. Hunter is my cousin's son. He was born 14 days after his due date but God wanted him to come home! He wanted to add one more beautiful angel. So in closing I will say, Rest In Peace Sweet Hunter. I am sorry I never got to meet you but I know that oneday I will be coming home and we will get to meet. Written by: Danielle at 10:44 AM 0 you know!